Hello and welcome to the 189th instalment of the SWD. 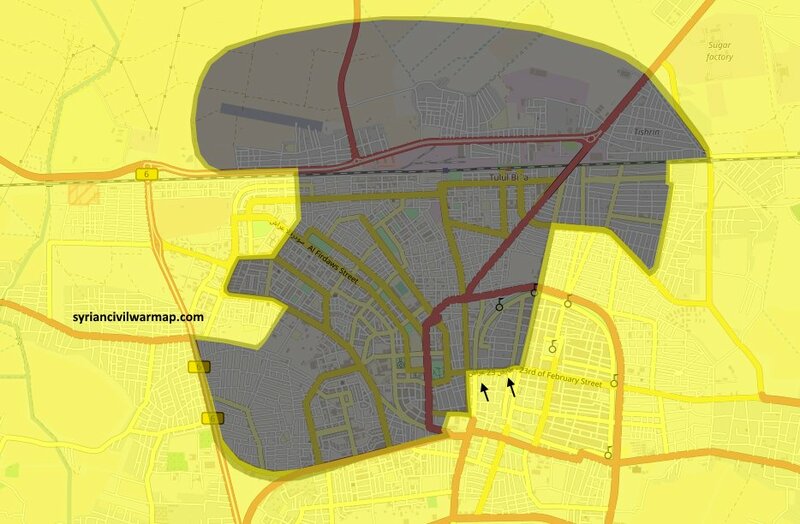 The Syrian Democratic Forces have fully liberated the al-Rasheed district in the Old City of Raqqa. Dozens of civilians have been freed thanks to this advances. Civilians remain as one of the main victims of Coalition bombings, at least 100 have died in the past 24 hours. Unconfirmed reports suggest that at least ten government soldiers have been killed and several wounded after an explosion took place on al-Nayrab air base. Additionally, one Russian soldier has been wounded after an unknown shot towards a Russian military patrol near Nayrab camp, in east Aleppo. The SAA captured Al-Elbawi, Jani al-Elbawi and Tal al-Elbawi, south of Jani al-Elbawi, in eastern Salamiyah countryside. Government forces found a system of tunnels in Tell al-Elbawi. Advances were supported by the Russian Airforce. The Syrian Arab Army bombed the city of Harbanafseh with Artillery. The Syrian Arab Army Tiger Forces captured multiple sites today, including Al-Souq, Qibab al-Faransia, Rujm Hajjanah, Jabal Hajjanah, and Qasr al-Hayr al-Sharqi. Meanwhile, the SAA troops around Sukhnah pushed 30 km towards Deir ez-Zor and captured a number of hills overlooking the highway, and the highway. The Syrian Army Shaitat Tribal Fighters and reporters have uploaded photos from Humaymah city, proving that SAA did capture the city from ISIS. 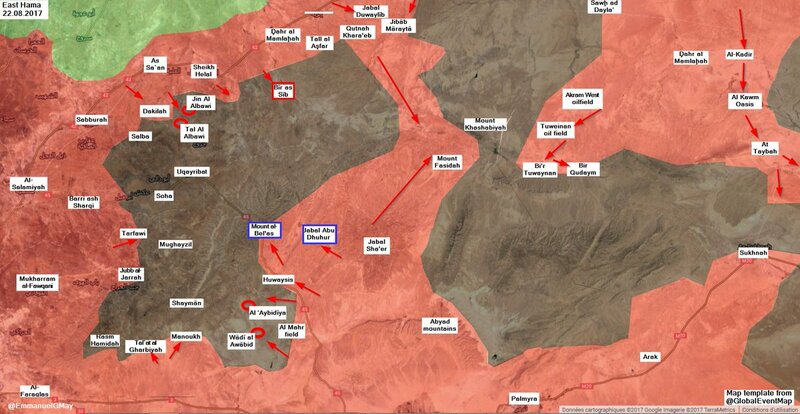 The SAA and Hezbollah have captured multiple sites in western Qalamun area. The different sites captured are Tal Safuf, Wadu ash Sugur, Ali Amin Division, Qalaat Al Hamam, Wadi al-Zuwiyayna, and Harf al-Jub, Beit al-Agha, Sheeybat Abu Ali Beit, Al Kunz Sheeybat, Sheeybat al-Khabia, Sha’ab Al Hadeer, and Shamis Al Hamail High School. The total area captured is of 30 square kilometres. Government forces continued shelling the different Damascus suburbs and villages located in East Ghouta. Jobar district and Ayn Tarma have been the main targets with artillery, surface-to-surface missiles and IRAM rockets. FSA unit Usud al-Sharqiya group announced that its field commander and one fighter have been killed in recent airstrikes on their positions. FSA engineers dismantled 12 IEDs disguised as stones planted into the roadsides of eastern Daraa region. Iraqi forces made huge gains during the operation to retake Tal Afar, west of Mosul city. Iraqi forces are pushing from the western and eastern sides of the ISIS-held pocket. Iraq Armed forces were on the verge of capturing the centre of the Muhallabiyah district, located in the east of Tal ‘Afar. The map below shows with green the liberated areas, with orange/red areas with clashes, and grey is the ISIS-held areas. On the 21st of August 2017, CJTF-OIR has conducted 22 strikes in Syria. CJTF-OIR‘s main focus in Syria is Raqqa region where they did 20 strikes supporting SDF‘s operations against IS destroying 24 fighting positions, a vehicle, a logistics node and ISIS communications infrastructure. Other areas where two strikes occurred are Abu Kamal and Deir ez-Zor destroying an ISIS headquarters, a weapons cache, and an ISIS oil still. The full report on CJTF-OIR strikes conducted in both Syria & Iraq can be found here.